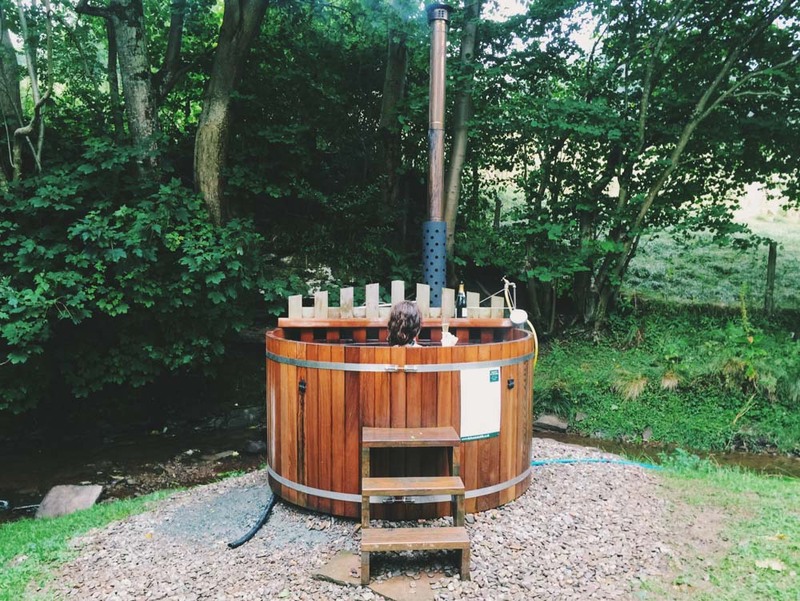 Sitting in a wood-fired hot tub, surrounded by trees, and with a glass of prosecco in my hand – is there any better way to spend a rainy day? 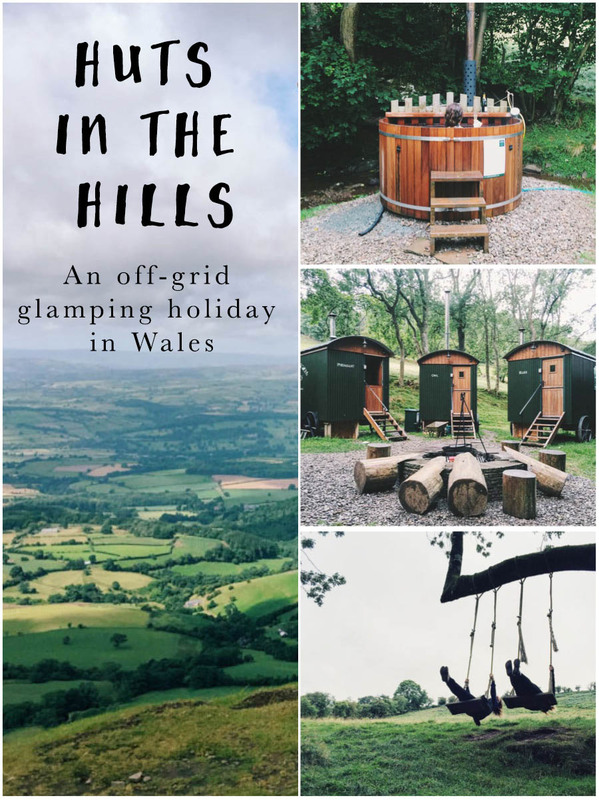 We’d dreamed of sunshine, but Wales delivered rain, and while reclining in that hot tub – warm, relaxed and invigorated – I realised it didn’t matter. 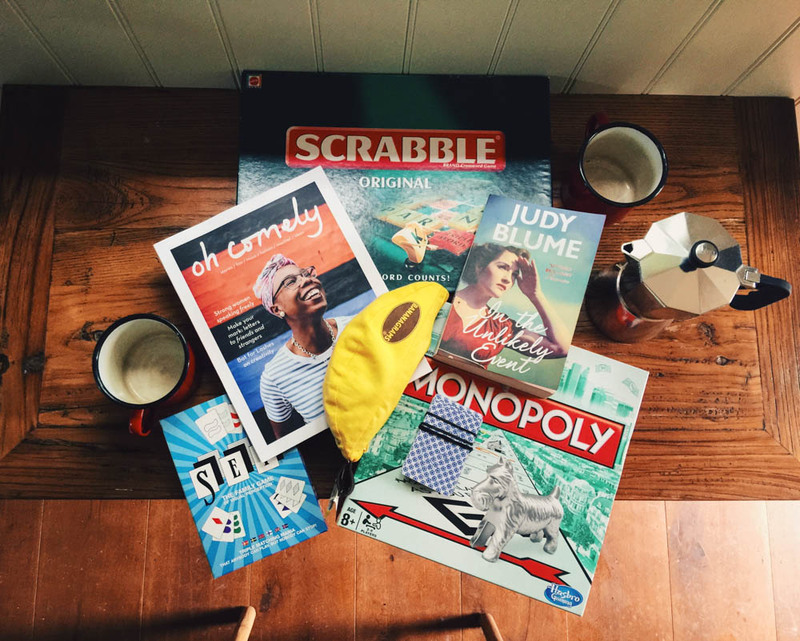 The UK isn’t well known for its sunshine but, for that reason, we’ve learned to do cosy well. We snuggle by open fires, bundle up and take brisk walks amid the chill, and sometimes, when we’re lucky, we sit in outdoor hot tubs with a glass of bubbly in our hands. 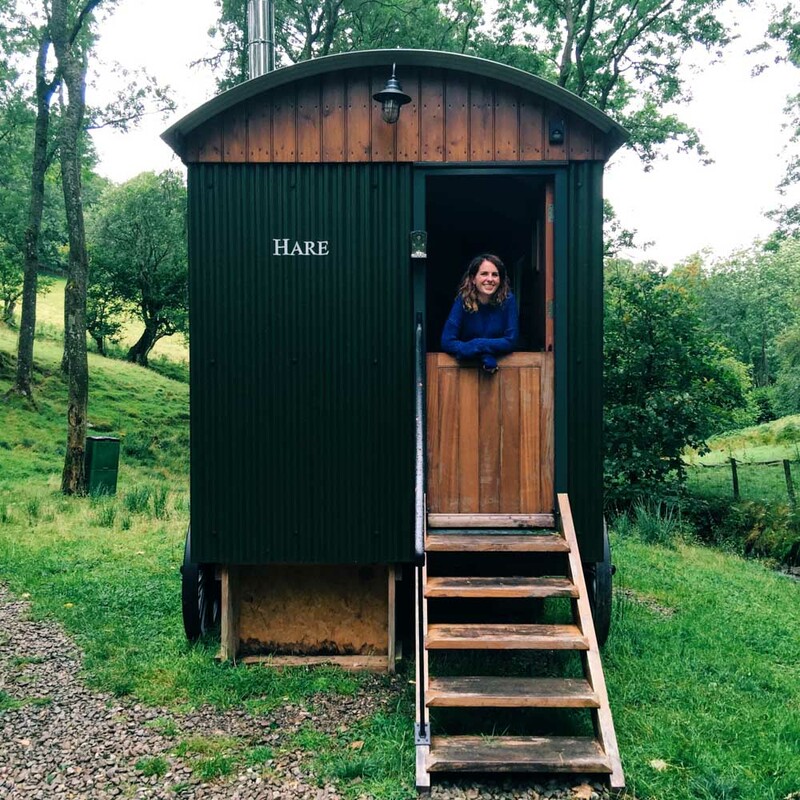 I found myself in that lucky position on a weekend in Wales, while staying at an off-grid holiday spot, Huts in the Hills. 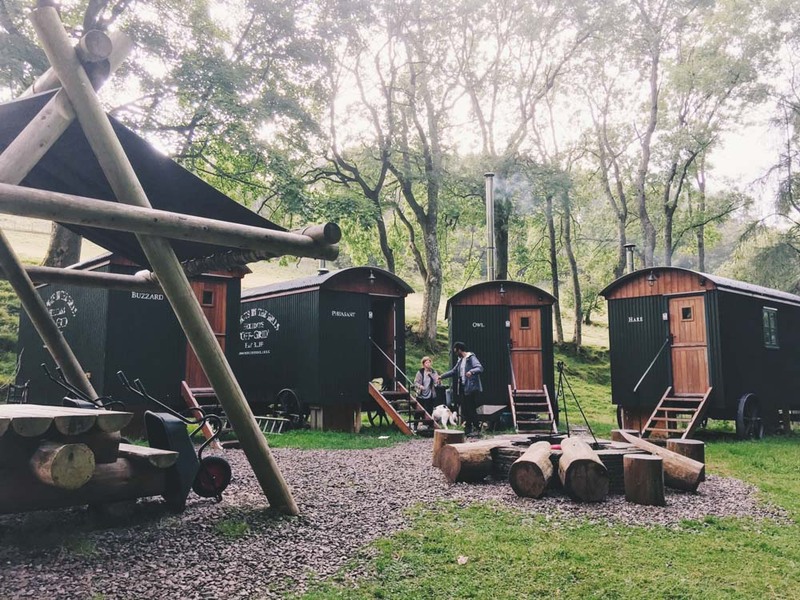 The picturesque camp sits in a little woodland clearing at the bottom of sheep-filled fields, where you can find a collection of shepherd’s huts converted into cosy rooms. 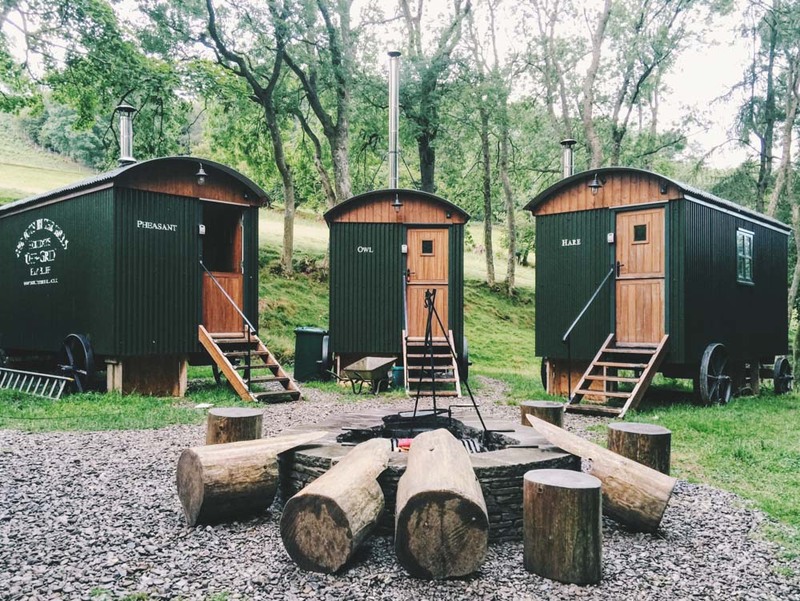 There are four bedroom huts and one communal hut with a kitchen and modern bathroom, all centred around a beautiful communal fire pit, just beside a stream. It’s the perfect ‘let’s get away from it all’ destination. 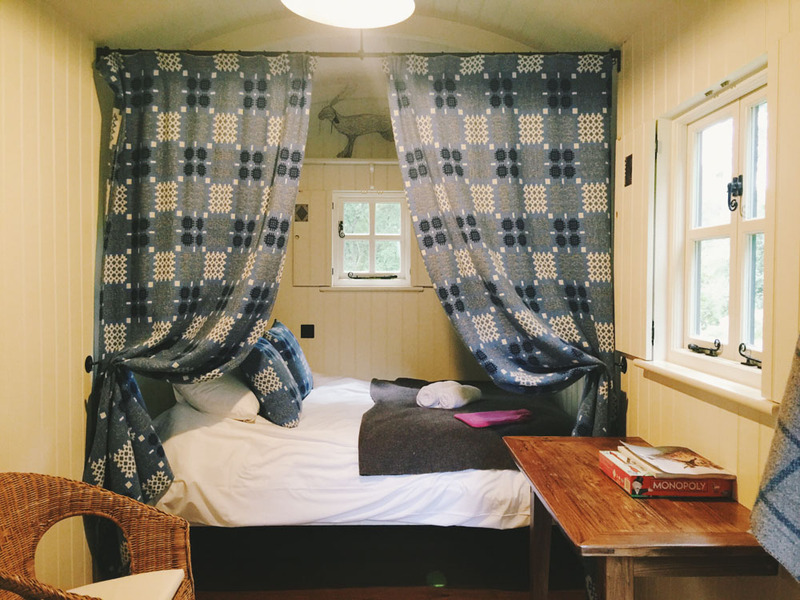 The bedroom huts are charmingly snug with a built-in double bed bordered by Welsh tapestry curtains, and a table and wicker chairs. There’s a little wood-burning stove in each one to warm you up on colder nights, but we found we didn’t need it, even in spite of the rain. 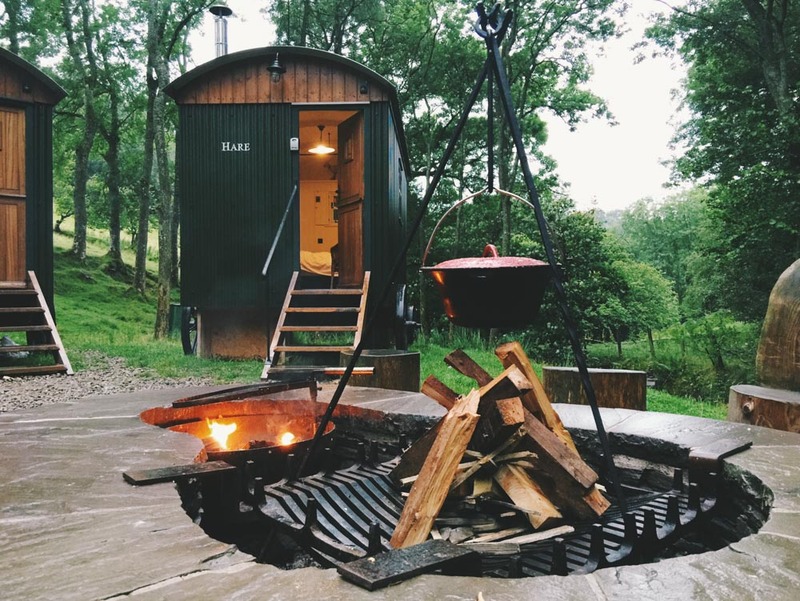 Hot water is provided by the impressive Esse stove that lives in the kitchen hut. It’s a delight to cook with, and the kitchen is well-stocked with all you need to make your daily meals. We also took advantage of the BBQ utensils and campfire pots to cook al fresco on the open fire. There’s something so satisfying about cooking in the open air on a fire you built yourself. We also learned an important lesson – cooking jacket potatoes on burning embers makes for the perfect spud – I highly recommend you try it! 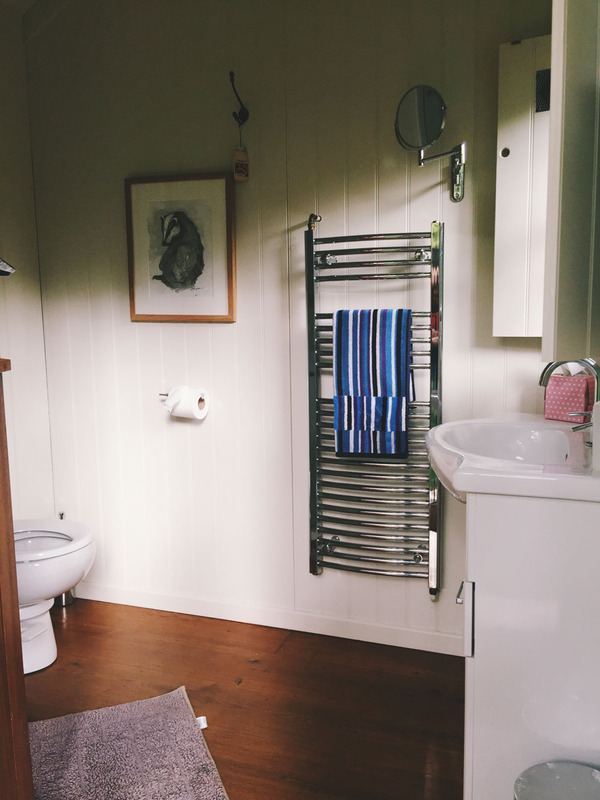 In fitting with the comfortable off-grid style, the bathroom was impressive with a modern shower, sink and compost toilet. All of it looked like what you’d find in a “normal” homely bathroom, and the whole room was kept at a perfect temperature but that magic Esse stove. Electricity for the huts is provided by wind and solar panels, and is enough to power both indoor and outdoor lights, a fridge, a hairdryer, and charge for several camera batteries. 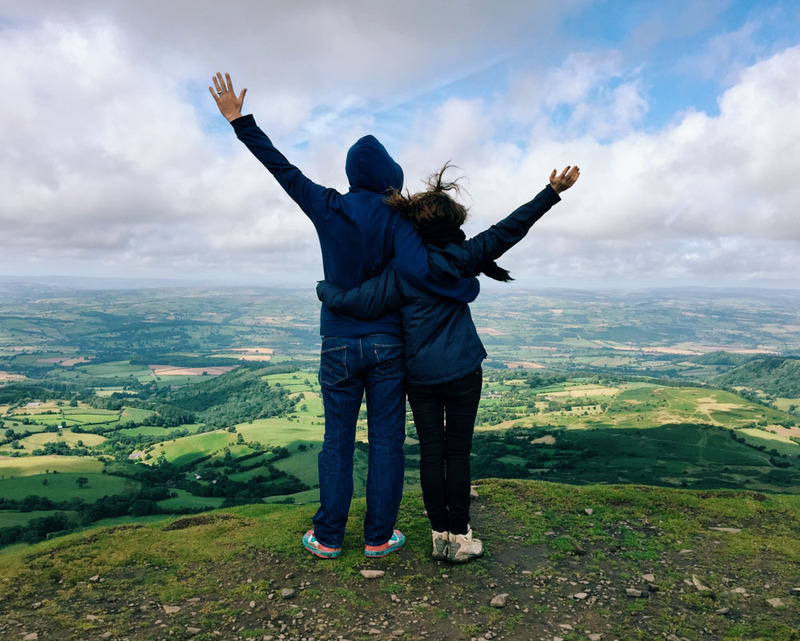 One of the joys of being in Wales is enjoying the great outdoors and, as well as being in the midst of it all while staying at the huts, it’s also worth going out for some walks in the surrounding area. We walked up Twmpa, also known as Lord Hereford’s Knob, which had spectacular views across the valley. 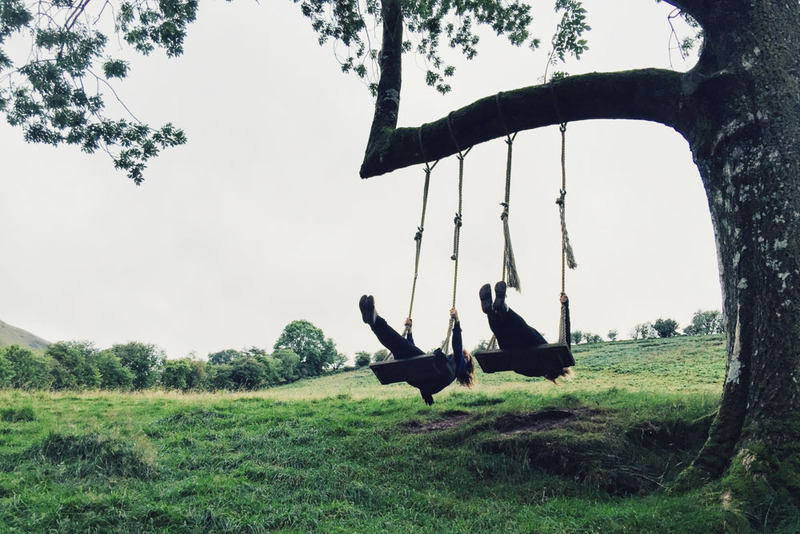 There are also some great walks around Hay-on-Wye, which is just five miles from the huts. And the town of books is certainly worth visiting, especially if you share my love of books. Back at the camp, the outdoors is as well done as the inside. The big communal table is ideal for group meals, and the little log seats create a friendly fireside vibe. There are even swings to take you back to childhood, and you can try your hand at wood chopping with an axe. There’s no phone service or wi-fi at Huts in the Hills iso it’s an ideal place to disconnect away from all your tech. It’ one of the few place where you can still do this –I’ve been on remote islands where I could still sneakily check my phone – and it’s refreshing not to have the option. Instead you can read and play board games. And finally, there’s that hot tub – the cherry in the huts’ cake. Make your fire then jump in once it warms up. It’s perfect, rain or shine. And the whole place is under a dark sky reserve so on cloudless nights you can gaze at the galaxy. 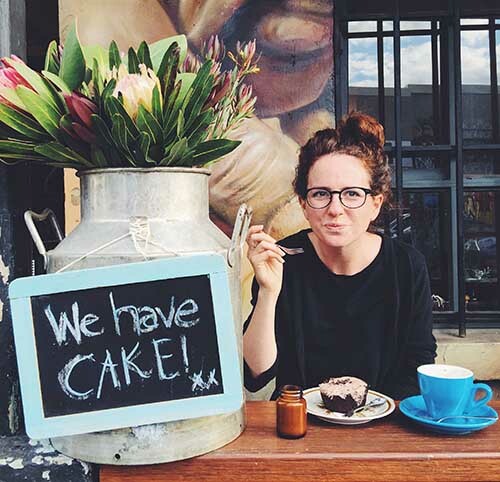 Pick a few days, book yourself in, and don’t worry if the weather forecast looks bleak. This is cosy and sustainable living at its best. We made the video in this post for Visit Britain’s #OMGB campaign. All opinions, as always, are my own. I loved Huts in the Hills. It’s beautiful! I love how they have modern bathroom which makes you feel more at home. Looks like ou had a fun experience. Yep, that definitely gives some welcome added comfort!